FFI is thrilled and honored to announce we have received a multi-year grant from the Kresge Foundation. This investment of operating support will help us to grow dramatically and sustainably in the coming years, expanding our infrastructure and operations and leveraging additional investments so that we can eventually work with over 50 nonprofit organizations and systems seeking to create the conditions that provide more equitable access to wellbeing for people and communities living at the intersection of poverty, violence, trauma and oppression. Want to make child welfare reform that lasts? Invest in supervisors—the people who oversee, guide, support and coach frontline workers who are in communities every day. In our partnership with Missouri Children’s Division, we are training all supervisors in the agency to incorporate an orientation around wellbeing and the Five Domains of Wellbeing into their supervision of and work with staff. Training frontline workers without training their supervisors creates friction and undermines change. Children’s Division supervisors are being equipped to drive, support and reinforce the changes being made as their agency adopts a new practice model based on child and family wellbeing. By this fall, every supervisor in the state’s child welfare department, and the supervisors’ supervisors, will have been through a two day intensive training, provided in small groups with follow up coaching. 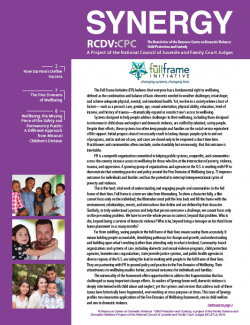 The results are already becoming apparent—seeing families in the “full frame” of their lives, leading to more trust and better information, which in turn helps the system make more informed decisions on how to best support children and strengthen families.